Cartoon Man Targeting shooting game features in group of four cartoon man targets that holding up guns on hand and getting ready in fury fire shot, player shot on the cartoon targets to progress levels to win corresponding tickets or tokens. In the game play, player shoot the targets rapidly with the light gun, guns are all with bomb, motion, running fire and volleying function. LED displays the time, score and bullets quantity. - player aims to shoot at the four targets with the light gun. - when all of the four targets fall down, player can progress levels to win more shooting experience for more tickets. 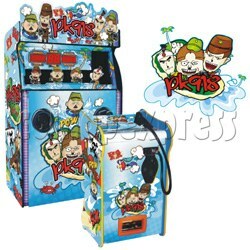 - when player finished all levels game play, it will reward corresponding tickets or coins to player. More targets shoot up, more ticket or coins reward to player. Notes: Online price quoted for one gun installed. More favorable price for two guns installed order.